Everyone loves a pig roast. Whether it’s a casual backyard event or a full service wedding, there’s nothing like the aroma of pork on the charcoal barbecue. At Country Meat Cuts and Lucy’s kitchen, we have been providing our clients with the very best pigs available, for over 40 years. We buy only Ontario raised, grain fed pork. It is simply the best your money can buy. 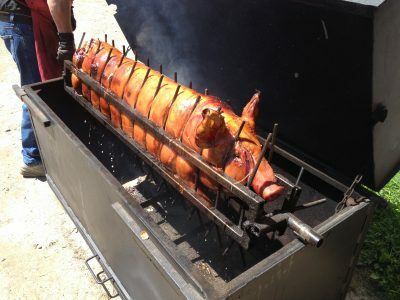 Our specially designed roasters, will cook the pig to perfection every single time. We have also become quite famous for our own, special bread and fruit dressing, which can be used to stuff the pig. The pigs are presented on a carving board with fruit decorations and all the trimmings. If you choose full-service, our chef will carve and serve the pork directly to your guests dinner plates as they come through the line. We can provide you with delicious side dishes as well. It doesn’t matter if you are looking for hot or cold foods, or a combination of the two. All of our side dishes are homemade. Absolutely everything is made from scratch, right down to our unique and delicious salad dressings. 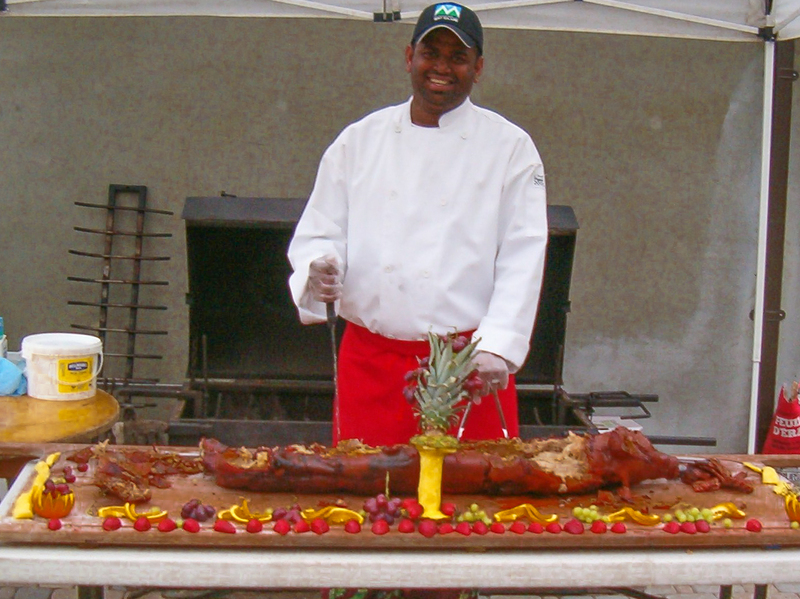 Our many, many clients will tell you that if you come to Country Meat Cuts and Lucy’s kitchen for your pig roast needs, you will always be served a fabulous meal. #4. 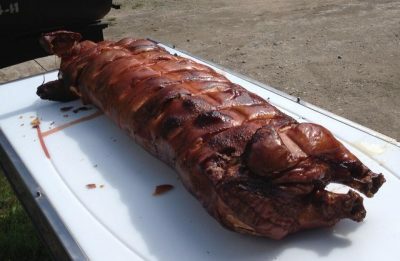 Whole, boned and stuffed, barbecued pig with full-service dinner, to include, three salads, or one potato, pasta or rice selection, two fresh vegetables and one salad. Each will include freshly baked breads & homemade herb butters. Also included will be one dessert choice. All foods are subject to availability and seasonal pricing. Unfortunately pig prices are fluctuating wildly at this time. This means we are unable to post pricing.